With rumors of the economy being on an uptick, a huge focus has been on employee retention. After all, when hiring steps up and employees aren't landlocked in their jobs due to a recession, what's going to keep them from jumping ship? Employee engagement through communication, recognition and rewards can help you in improving retention in the near future. The ultimate goal is to create a work environment that entices people to stay loyalty to your company and not actively seek out greener pastures. Even with all of that engagement effort, assuming it's done effectively, what do you do if one of your employees is bent on leaving? Do you still want them there? Let's take a page out of ESPN's NFL news. We rarely view professional athletes as "employees" but let's try to wrap our heads around that for the next few moments. 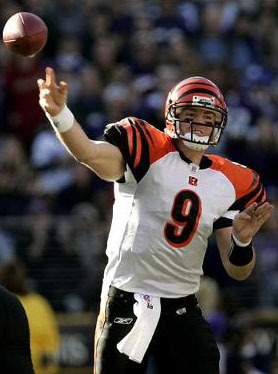 Carson Palmer from the Cincinnati Bengals is currently asking to be traded. He is apparently tired of his tenure with the Bengals and wanting to move on elsewhere. The catch is - his coach won't let him go. Even at the point of threatening retirement, his coach is bent on keeping him regardless of his attitude towards the organization. We know retention is obviously important to any organization but at what limits? Sure the search for a new candidate (quarterback in this case) could be costly. However, what's the cost of a disengaged employee? If someone is willing to leave but not allowed, what do you think that would do to their work effort inside the office after that? Do you think that individual would be motivated and productive? A willingly less engaged and productive employee could do more harm than good....and ultimately be more costly than replacing them. What do you think? Is the Bengals' coach making the right move forcing Palmer to stay? Would any manager be wise in doing the same? For those out of the loop, below is an ESPN report on the matter. For those of us who get "Bengals" and "Bangles" confused, this link here is for you.